First and foremost, I totally don't know what is going on in Enugu state, where hundreds of people have been murdered by the Hausa Fulani herdsmen terrorists on several occasions without any of them brought to justice; unlike what is obtainable in the case of peaceful Biafra activists whence there have been continuous arrest of thousands of peace loving IPOB members, for exercising self determination which is universally lawful. 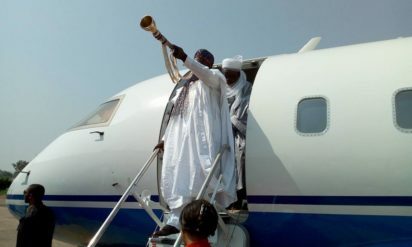 On 19th of October 2016, It was a big event at Enugu Okpara square Independence layout area, when the whole area was crowded with a larger population of people and top government officials from different and various offices, smiling and all rejoicing awaiting for the arrival of the Sultan of Sokoto and many other top officials coming from different places to Enugu. On the arrival of the Sultan and the governor of Enugu state at the venue ground, people of Enugu hailed them in great cheers, and the celebration of the Victory of Rangers FC in the just concluded NFF competition in Nigeria. The Sultan of Sokoto, Alhaji Muhammad Sa'ad Abubarkar III came up to the podium to render his speech and the reason why he came. He started with a language which is never understandable by the people of Enugu and there was some confusions in the language usage which lasted for 3 minutes before he bounced back to speaking English language, the whole place was full of drama. - He's visitation to Enugu is a historic visit which means so many things in the history of Nigeria. - He said despite the Economic recession in Nigeria, it has not appeared on the faces of the individuals in Enugu. - He narrated in brief, his live history in Enugu Nsuka area precisely when he was serving as a military. - He said that it is only Nigeria throughout the whole world where Christians and Muslim in a larger population were joined together as one entity. - He openly said to the people of Enugu and the governor that there have never been any plans to Islamize Nigeria in any way at all. - He stated openly that the killing of south easterners and south southerners by the Hausa Fulani was an allegation laid against the Fulani's. He continued that the process of Islamization is never done by killing nor by violence, the Igbo people have lied against them the Hausa Fulani. - He stated clearly that no man born of woman can divide Nigeria, and his visitation to Enugu has tightened the Unity of Nigeria and anybody looking for Division of Nigeria will be punished in accordance to law and constitution. - He further explained that we are all one, no matter the religious differences, language differences, traditional differences. - He concluded by telling the whole students not to mind people preaching hatred about Nigeria or the division of the country. So after his speech presentation, the governor of Enugu took over the microphone to address the audience. He greeted the audience and a special welcome address to the Sultan of Sokoto and his entourage. He addressed the Rangers FC and appreciated their victory in the football tournament. The governor stated that Nigeria still remains one and nobody can divided Nigeria. He also appreciates the large crowd of Hausa Fulani people that came to the event. The governor let the people to know that the visitation of the Sultan of Sokoto has built a bridge to connect back the unity of Nigeria. He concluded by awarding the Ranger Foot Club of Enugu with a sum of 41,500, 000 naira plus plots of land within Enugu territory. Immediately after the governor's presentation followed the popular and controversial Enugu Catholic priest, Rev.father Camilus Ejike Mbaka of the Adoration ministry, who took over the stage to lead the prayer for Nigeria. He appreciated the presence of the top Guest of the day, the Sultan of Sokoto and many others, he continued by laying emphasis on the reason why he came to the program which is because he is also one man behind the victory of the Rangers FC through prayer back-up and many other things which he can't make public. He finally led the prayer for Nigeria Unity. So many other government officials also spoke during the course of the event, with a lot of emphasis laid on the fragile nature of Nigeria, and calls for the unification of the country.